In Santa Cruz, we have our very own little esplanade where we can walk or bicycle whenever we get the urge, West Cliff Drive. From time to time, we explore the rest of the California coast, and spent a short week doing so in July 2008. Our first stop on this vacation was in San Simeon, the village below Big Sur where Julia Morgan helped William Randolph Hearst build his summer home, Hearst Castle. We'd driven past it on earlier trips up and down the Coast, but never visited. The motel where we spent the night boasted a few hundred yards of ocean frontage, with the Pacific lapping at the shore about 50 yards from the room. They lit campfires along the front during the evening. The boys heated marshmallows in the flames, and then sandwiched them between graham crackers with chocolate to make s'mores. 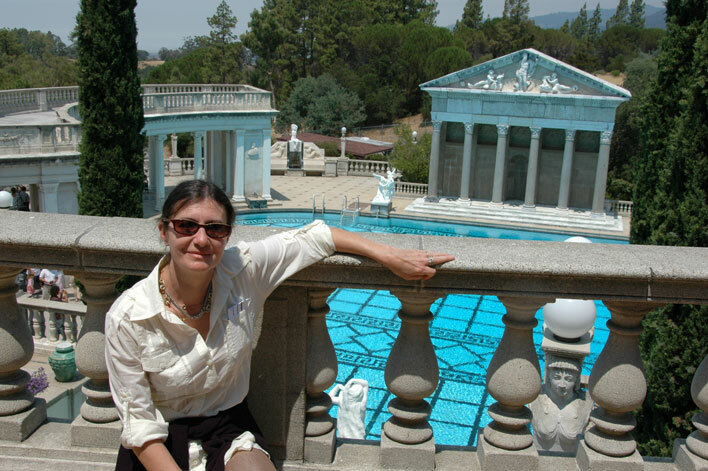 On the left, Marie-Hélène posed in front of one of the Castle's beautiful swimming pools. Below are other shots of a trip which was a lot of fun, if a little short for a summer holiday. 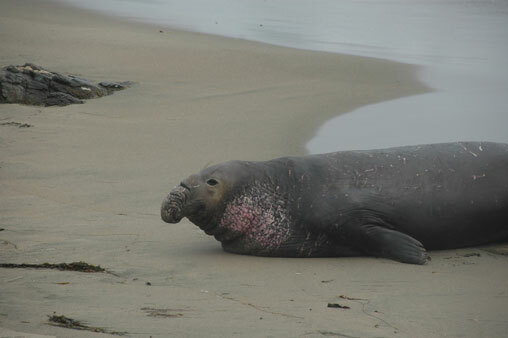 A few miles up the Coast from the Castle, on a beach called Piedras Blancas, each spring and summer a colony of elephant seals comes to stay. 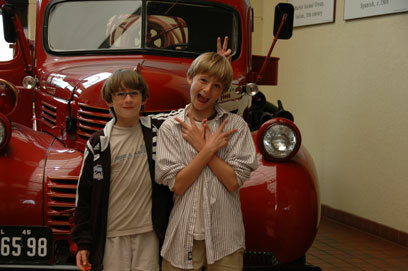 Alex and Charlie in front of one the Castle's old firetrucks, restored and housed in the visitors' center. We studiously avoid learning what the gestures mean! Our next stop was Disneyland. 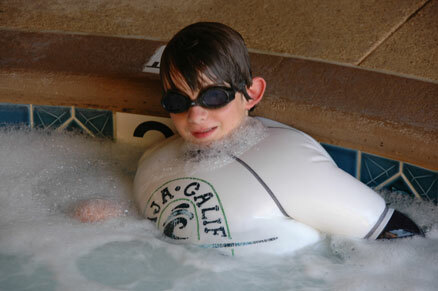 In our motel across from the park in Anaheim, Alex discovered the joys of filling his t-shirt with the jacuzzi's bubbles. 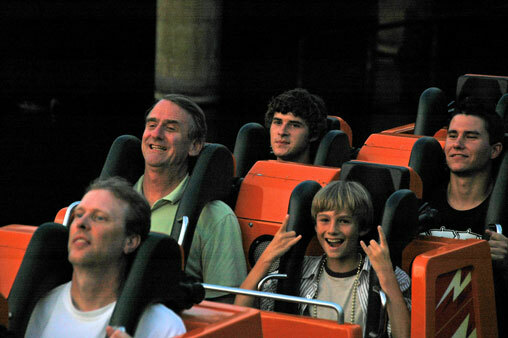 It was a rollercoaster day, with us spending most of our time in the California Adventure Park rather than in Disneyland next door. Good times! 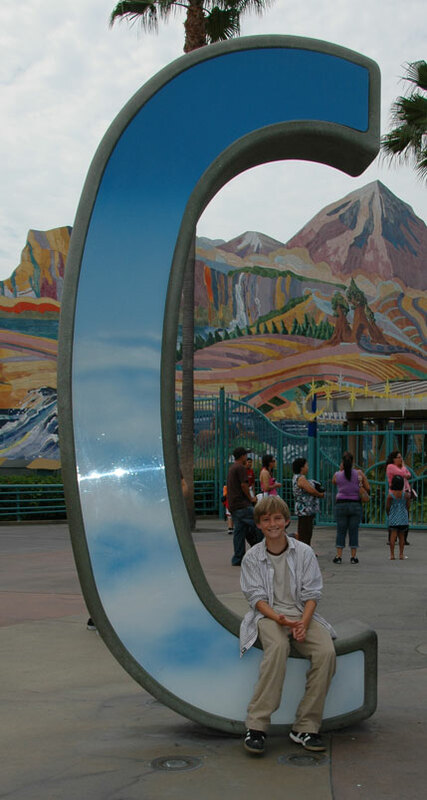 Charlie, sitting on the "C" in "Disney." Tilt! That's "C" as in Disney's California Adventure, the new twin park to Disneyland opened in 2001. Here's Alex with the "A" on an earlier visit. On the left, the most lasting portion of the trip, provisionally installed in the living room at home. We found the store which sold mantelpieces to Hollywood studios, including for "The Titanic," and picked one in wood painted white. They also made them in white stone. 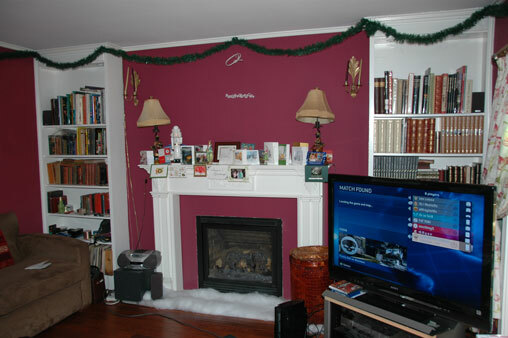 This was how the living room looked for Christmas, with the cards on the mantel between the lamps and the new high def. TV off to the side waiting to be mounted above the mantel. Okay, we admit it, we're sneaking this last one in! 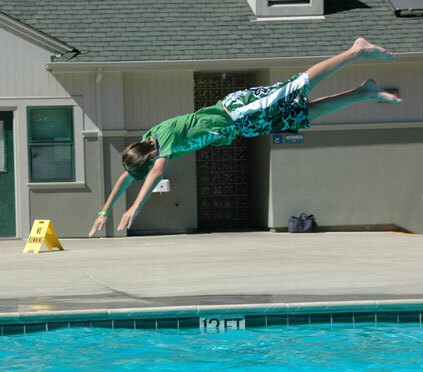 On the right, Charlie is diving at Harvey West Pool in Santa Cruz a week before we took off down the coast. Even when we take a short summer holiday, the family spends the rest of every summer in a holiday town on the Pacific Ocean! Here are the other 2008 photo journal pages: Tom living in Paris, Alban out and about in Santa Cruz, Ian on a short visit to family in England, birthdays and other special days in 2008, soccer in 2008, portraits in 2008 and, last but not least, the main 2008 journal page.